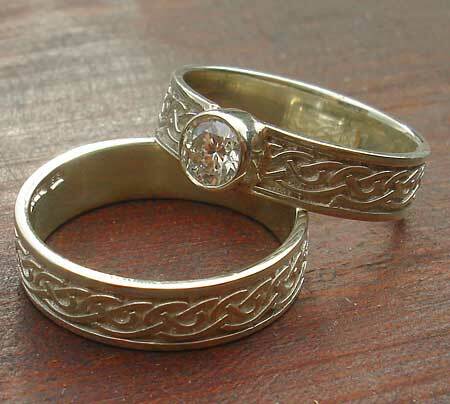 Scottish Diamond Celtic Engagement Ring : LOVE2HAVE in the UK! 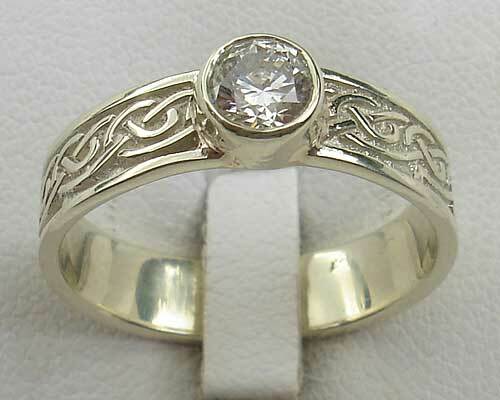 This luxury Celtic engagement ring is a traditional Scottish Celtic engagement ring shown here in 9ct white gold and set with a sparkling 45pt white diamond. The Celtic knot pattern features around the entire outer of the ring symbolising the never ending in the Celtic language. The ring measures approximately 5mm wide and the diamond 4.8mm in diameter. It is also available in purple amethyst and red garnet which are both also listed in this section. Gemstones(s) Available: 1 x 45pt white diamond. Returns Policy: This Scottish made Celtic engagement ring is made to order so, therefore, non-returnable unless faulty or not as described. Please see our terms and conditions.